I originally reviewed this book as a guest reader for The Indie Bookshelf. The Indie Bookshelf is a blog created and run by a group of frighteningly talented women who support independent authors. It is something like an Aladdin’s Cave for book lovers and a great place to find your next book. Roller Deb lives with her mother who despises her and her beauty queen sister in a trailer park. She is the regular target of town bullies, including the sleazy son of a local mobster. After her sister is kidnapped she sets out to find her and set her free, but with what seems like the whole town hunting for her things aren’t looking so good for her. Harlow is a troll. He lives at the local dump where he has everything he needs except any memories. Strange (for a troll), but he feels a deep compulsion to protect Roller Deb. Time is fast running out and Deb needs to trust Harlow for there to be any hope of finding her sister, defeating a mobster and maybe even saving a unicorn. 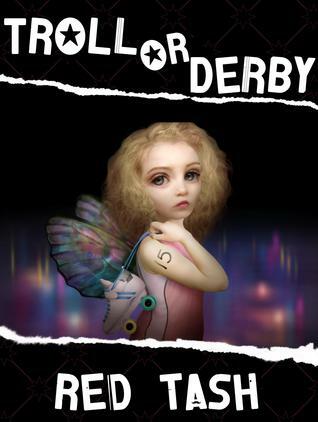 Troll or Derby is fairy tale but it’s not a children’s story. When the first edition of Grimm’s Fairy Tales was published in 1812, it was widely criticized for the violence and even sexual content. In ensuing editions the tales were edited to make them more suitable for children. Many thanks to Red Tash and The Indie Bookshelf for providing me with a review copy of this book. This entry was posted in Uncategorized and tagged fairies, Fairy Tale, Red Tash, Roller Derby, Troll or Derby, trolls by setaian. Bookmark the permalink.